Herman E. Talmadge was born on August 9, 1913, son of Eugene Talmadge, who later served as Governor. Herman Talmadge himself served as Governor and United States Senator from Georgia. The first Georgia state Motor Fuel Tax was enacted on August 10, 1921, when Governor Thomas Hardwick signed legislation imposing a one-cent per gallon tax. On August 9, 1988, President Ronald Reagan announced his nomination of Dr. Lauro Cavazos as Secretary of Education, succeeding William Bennett. Cavazos was the first Hispanic to serve in a Presidential Cabinet position. Interestingly, he was born on the King Ranch. On August 9, 1990, voters in the City of Athens and Clarke County chose to unify the two governments into Athens-Clarke County government. Jerry Garcia died on August 9, 1995 of a heart attack in Forrest Knolls, California. I was in a record store in the Fan District of Richmond, Virginia after work when I heard of his death. The North Fulton GOP Breakfast is on hiatus for the summer, so there is no meeting this weekend. My bad. As an apology, I will pay for the breakfast of the first five GaPundit readers tomorrow morning at the DeKalb County Republican Party meet-and-greet with Republican candidate for State School Superintendent Richard Woods. Tell them to put it on my tab. The Phoenix Air Gulfstream III that was used to transport two Ebola patients from Liberia has returned to its hangar in Cartersville – Daily Tribune. Clint Hinton of Dacula, Ga was named a member of the Krieghoff All-American Sporting Clays Team, a position he has held every year since 2011; he is also a member of the 2014 NRA All American Shotgun Team – Gwinnett Daily Post. Libertarian candidate for Governor Andrew Hunt spoke to the Gwinnett Tea Party meeting this week – Gwinnett Daily Post. A memorial to 42 Georgia National Guard members who were killed during the Global War on Terror was dedicated at the Clay National Guard Center in Marietta on Wednesday – Marietta Daily Journal. Some Marietta residents are complaining that the city’s Board of Zoning Appeals is treating a City Council member more favorably than they treat others because of his position – Marietta Daily Journal. Discussions over the merger of Savannah and Chatham County police departments appears to be getting testy, according to Mayor Edna Jackson – Savannah Morning News. Lady Antebellum has been selected for the Georgia Music Hall of Fame and will be inducted on Oct. 11 at the Georgia World Congress Center in Atlanta, with Georgia Public Broadcasting televising the ceremony live – Augusta Chronicle. Augusta owns goats? Who knew. The six goats are currently undergoing veterinary care but will be “deployed” to maintain vegetation at a retention pond on Monday; Apparently, “goat herder” is now a legitimate government job description – Augusta Chronicle. Chatham County Republican Party has 100 free tickets to the August 16th game between the 2013 South Atlantic League Champion Savannah Sand Gnats and the Greenville Drive, sponsored by Rep. Ron Stephens, Rep. Ben Watson, Sen. Buddy Carter, and Jesse Petrea – SavannahGOP.com. A former starting fullback with the University of Georgia’s 1976 SEC Championship team is among three finalists for Superintendent of Chattahoochee County Schools – Ledger-Enquirer. Army Captain Jeremy Haynes, from Dougherty County, was wounded in the attack in Afghanistan that killed Major General Harold Green, whose aide Haynes was – Albany Herald. 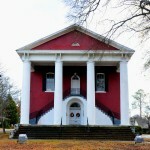 Historic properties in Chatsworth, Georgia will be open on Saturday when the Whitfield-Murray Historical Society will be telling about the city’s history – Dalton Daily Citizen. A referendum on using SPLOST funds to purchase a new location for the library and use the current library site for recreation will be on the ballot for voters in Temple, Georgia – Times-Georgian. Douglasville City Council voted to raise the millage rate by 50 percent to 5.784 mills – Douglas County Sentinel. The Georgia State Ethics Government Transparency and Campaign Finance Commission might as well move to Cherokee County, as a new rounds of ethics allegations against former Canton TEA Party leader Carolyn Cosby has been filed – Cherokee Tribune. The State Board of Education will hold a public meeting on Common Core 13th on Tuesday, Aug. 12, from 7 to 8 p.m. at Alexander High School in Douglasville – Times-Herald. After the Fulton County Commission voted to raise the millage rate by 17%, six members and one former member of the State House of Representatives filed two lawsuits claiming the tax hike is in contravention of state law. In addition, Atlanta resident Teresa Proctor filed a lawsuit Thursday in the same court. She also is challenging the whether commissioners had the legal authority to raise taxes and is seeking class-action status for the litigation on behalf of all Fulton County property owners. “No other county should have its rights to govern its own affairs trampled upon by outside entities,” he said. Last year, the General Assembly approved a tax cap for Fulton – part of a flurry of legislation inspired by concerns that the county spends too much money. Opponents of tax increases say the county should cut spending to balance its budget. The cap prohibits Fulton from raising property tax rates until 2015. After that, it requires a super-majority of commissioners (five of seven members) to approve a tax increase. Jones, the primary author, said the legislation is based on a 1951 local constitutional amendment that grants the General Assembly broad authority over Fulton property taxes. Long before the issue arose with the millage increase, Fulton County Commissioners repealed HB 604 as it represented an infringement upon its authority to govern its own affairs. House Bill 604 was passed by the Georgia General Assembly and signed by Governor Deal. The claim by Fulton County Chairman that the Fulton County Commission has authority to repeal legislation passed by the legislature and signed by the Governor is patently absurd. It is clear that Eaves has taken a page from President Obama’s playbook.